... or how we lost our bearings! Over the summer we had been planning a road trip that would take us into Montana, over the Beartooth Pass and into Wyoming, across Yellowstone from east to west, then home to Calgary. This would be the first road trip that we would do with another couple. 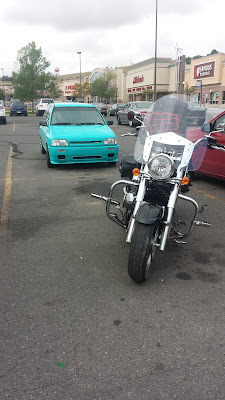 Kent and Lisa were going to be on their Kawasaki Vulcan 1700 and we were going to be in our "new" Festiva. The plan for the first day was that we would rendezvous at our Great Falls hotel on the evening of the 23rd. Kent and Lisa took a more leisurely route than we did as we had decided to get there as quickly as possible as we had some shopping we wanted to do. The day started out with great weather for driving. Our chosen route took us from Calgary to Lethbridge via Alberta highways #2 and #3. From Lethbridge we headed towards the border at Coutts/Sweetgrass. After an uneventful border crossing we stopped at the first rest area for a quick bite to eat. Once done, we continued south on Interstate 15 enjoying the 80mph (129 km/hr) speed limit. So far so good! We were making good time, the weather was perfect for driving, and the car was running well. Just as we were approaching Great Falls, we heard a noise from the rear driver's side of the car that sounded a bit like we had run over something and that seemed to slow the car down momentarily. I pulled off to the side and couldn't see anything obviously out of order so decided to continue on our way. The first significant curve we came to resulted in an awful grinding noise from that same back corner and I knew right away that we had bearing problems. We had pulled off right an exit so turned on the emergency flashers and proceeded slowly down the road to see if we could find a parts store to pick up the necessary parts to make the repair. Changing the rear bearing on a Festiva is not a big job and can feasibly be done in a parking lot if the need arose... and it did! Our first likely stop turned out not to be a parts store but we were kindly directed to one not too far down the same road. I knew we had found a good parts place as there was a Festiva in the parking lot that turned out to be their parts runner! A big thank you to Roger at The Parts Store for helping us out on day one of our road trip! Without it there would not be a day two! It turned out that the wheel bearing partially seized up on one wheel and Roger had all the parts needed in stock and he even loaned me the tools I needed to make the repairs. Our day was not totally lost. One of the stops we wanted to make was at a glasses shop to check out prices. Turns out glasses can be a lot less expensive in Great Falls than in Calgary. Picked up two pairs, both prescription, one sunglasses, for about $225.00US. Those would have been probably three times the price at home. So after you've picked up your car parts at the Parts Store head over to Eyemart Express on 10th Avenue S and get your new glasses! Added bonus.... my sunglasses were ready in an hour! We met Kent and Lisa at the hotel later in the afternoon as planned. It was nice out so we decided to go for a walk and ended up at Beef 'O'Brady's for an evening meal. Great food, great service and reasonable prices. Spent the rest of the evening sharing our travel experiences and going over our route for the following day. The hotel we stayed at last night did not include a breakfast so we met at the closest McDonald's then headed to a grocery store to get a few supplies for the day. Our route for the day would take us to Laurel MT via White Sulphur Springs. The weather wasn't looking that great for the day and we hadn't been on the road for much more than twenty minutes when Kent and Lisa stopped to put on their rain gear. Our first planned stop was Sluice Boxes State Park. We turned off Highway 87 and then discovered that there was a fee to park and do the hike along the creek. Plan B kicked in and we drove up a side road a little way to find a place to stop and take some pictures. Sluice Boxes State Park from an unofficial viewpoint. Sharon heading back to the car. Kent and Lisa smiling, not quite singing, in the rain. Sluice Boxes State Park from the official viewpoint right off Highway 89. The drizzle continued on and off as we continued south through Monarch and Neihart MT to Memorial Falls. Well worth the stop but made a little less enjoyable by the continuing drizzle and cool temperatures. The drive from Memorial Falls to White Sulphur Springs is only about 40 minutes. Our plan was to stop there to top up gas tanks and have a bite to eat. Half way there we started hearing a kind of rumbling or mild roaring noise. My first thought was that the rear bearing repair we had made in Great Falls was beginning to fail but both Sharon and I were convinced that the noise was coming from the front of the car. While stopped for lunch we checked the car over and couldn't find anything obviously wrong with the wheels but did discover that part of the intake had been rubbing on the hood. Thinking that we had found the source of the noise we utilized some cable ties to firmly secure the offending part. Repair completed we pulled up to a picnic table for a light lunch before heading to our next destination. Backtracking a bit on Highway 89 we then headed east on Highway 12 towards Martinsdale MT and the Charles M Bair Family Museum. It didn't take long to discover that the intake wasn't the issue, that the noise was still there and we were still convinced it was coming from the front. We took it easy on our way to the museum and upon arrival I had another look over the car, pulling off all four wheels with no new insight as to what was causing the noise. First view of the ranch house. That's Marguerite Bair in "Whistling Billy", purchased by Charles in 1907. You can find more information on this fascinating steam car here. One of many solid gold door pulls! Sharon and me after the tour. After our tour of the main floor of ranch house (the upper floor is not generally open to the public) we headed towards our next night's accommodations in Laurel MT via Billings. The noise came back but didn't seem to be getting any worse and narrowed down the source to the front right side. I contacted a member of the forum at www.fordfestiva.com that lived in Billings to see if he could help us out. He offered me the use of his garage to remove the front hub so that I could take it in to a shop he had used in the past. We all checked in to the hotel in Laurel, grabbed a bite to eat, then Kent and I walked down to one of the nearby parts stores to pick up some needed parts. We had discovered that the front brake rotor on the passenger side was warped so along with new bearings we picked up a replacement. I then drove back in to Billings and met up with Alex at his garage. We pulled the hub off my car, spend some time sharing Festiva stories and then he drove me back to the hotel. The original plan was to spend the following day driving from Laurel MT to Cody WY via the Beartooth and Chief Joseph highways. Our revised plan was that Kent and Lisa would head off and we would follow as soon as we could. If it got too late we would just drive straight to Cody. Alex picked Sharon and me up at the arranged time, we stopped in Billings to pick up some of the parts we had ordered the day before, dropped Sharon off at a convenient thrift store and then he dropped me off at Shiloh Automotive with the parts. I waited at a nearby Wendy's while the hub was rebuilt and in very reasonable time I got a call that it was ready. Alex picked me up and we went back to his place, reinstalled the hub and then went to pick up Sharon at a nearby City Brew coffee shop. We gave our thanks and said our goodbyes to Alex and headed off. It was still early enough that we had time to take our originally planned route but without Kent and Lisa as they had already gone on ahead. It didn't take long to realize that the repairs we had just done had make no difference in the noise! We retraced our steps back to Shiloh and had the owner come and take the car for a test drive. He was certain that the noise was coming from the front as well but reasoned that it must be coming from the driver's side as the passenger side had just been rebuilt. So back into the shop it went. We received a call a bit later that afternoon that they had completed the repair on the front hub but had decided to check the rear bearings while they had it on the hoist. The passenger side was fine but they discovered that the rear spindle on the drivers side had been damaged a bit more that I had originally thought so their recommendation was that the spindle be replaced and new bearings be installed. We agreed to that but it meant that we had to wait until the next morning as they wouldn't be able to get the needed parts until then. They were kind enough to drive us to a nearby hotel for the night indicating that they would aim for a completion time of around 12:30 the next afternoon. We had to call ahead to our hotel in Cody because the reservation for our room was in our name. It was fortunate that we had decided to share hotel rooms with Kent and Lisa over the course of this trip so the room wasn't going to sit empty. Our revised plan for the following day was to drive through Red Lodge MT, over the Beartooth High, through Yellowstone NP and rejoin Kent and Lisa in Ennis MT. If the car wasn't ready in time we would still drive to Ennis but by a more direct, quicker route. As you can well imagine we were disappointed that we weren't able to travel with our friends on this part of the trip. We did however make a bit of an adventure of the time we had before the car would be ready. We figured out how the Billings bus system worked, which busses we would have to take and where to get on and off. Having read that all we had to do is stand by the road along the bus route and wave we made our way to the nearest rendevous point. We were thankful that we had decided to leave the cooler in the car which left us with only the pull along suitcase. We saw a bus coming and waved, thinking this better work! In our hometown of Calgary there are designated bus stops and that's where you get on and off the bus. Sure enough, the driver pulled up alongside us and we hopped on. We were headed to one of the hubs where a number of routes come together so we didn't have to worry about missing our stop. If we did want to get off before the terminus all we would have had to do is ring the bell and the driver would pull over at the next corner! The end of the line for this first bus was close by a mall where we thought we could grab a coffee while we were waiting the twenty minutes or so for the next one. Well that didn't work out as the mall didn't open for another twenty minutes or so. On to plan D, or is that E, I've lost count. Because the weather was really nice and the route to the shop was fairly straightforward we decided to walk the rest of the way. There was a McDonald's part way there where we stopped for a coffee. We were within five or ten minutes of the shop when we got the call that the car was ready to be picked up! We paid up our bill, said our thank yous and headed on our way. It was about 12:30 or so which gave us enough time to take our preferred route through Red Lodge and over the Beartooth Pass. We pulled onto the interstate and got up to speed and thankfully the mystery noise had been eliminated so we sighed a sigh of relief as we texted our friends to let them know we would meet them in Ennis that evening. Well, that relief was short lived as a new noise manifested itself about ten miles outside Red Lodge. We pulled in to Rocky Mountain Tire and spoke to Jerett, the owner. He took the car for a test drive and, to cut a long story short, discovered that the repair on the driver's side front hub had failed. Keep in mind that it is now 3 o'clock on a Friday afternoon. The repair shops in Red Lodge are not open on the weekend so we would have had to wait until Monday to get the car in and then wait another day to wait for any parts that were needed. 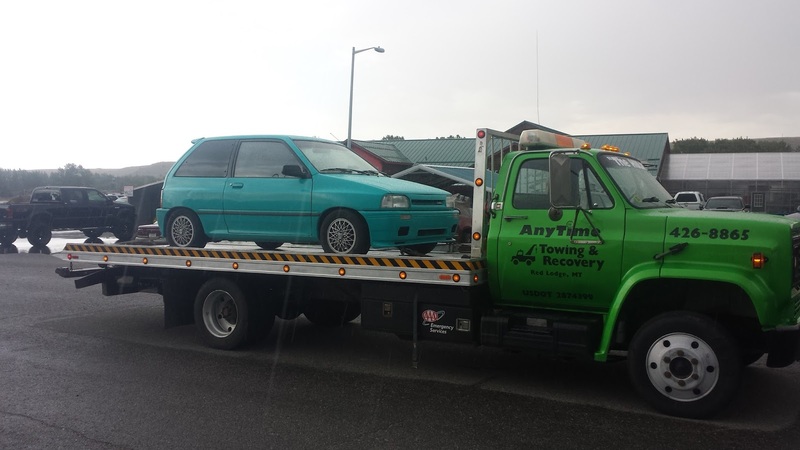 Jerett's recommendation was to have the car towed back to Billings and get things sorted out there. 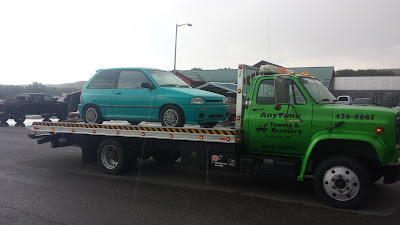 He contacted the local AAA tow truck driver for us and we were soon loaded up and on our way back to Billings. Loaded up on "the Hulk"
Had a great conversation with Jeremy, the owner of AnyTime Towing and Recovery. He was very helpful and looked after all the paperwork associated with our AAA membership. We also used the time to try and set something up with Shiloh. Unfortunately we ran into a similar situation as far as shops being open. Nothing was going to open on the weekend which meant a possible stay until Monday or Tuesday. We were resigned to spending at least Friday night in Billings so Jeremy dropped us and the car off at our hotel of choice. While enroute to Billings I had also contacted Alex. He had done the same brake modifications on his Festiva as we had on ours. He generoulsy offered to loan us the front hub off his car so we could get home on Saturday, he had two Festivas so wouldn't be without wheels. Our car was driveable over short distances so I left Sharon at the hotel and headed to Alex's to complete the swap. By this time Alex and I were getting really quick at removing and installing Festiva front hubs so I was back at the hotel in just over an hour! We got up fairly to have breakfast and head out on the road. The drive home was a little nerve wracking as with every bump, groan and other noise made us think we were about to break down again. The road home... approaching Sweet Grass MT. We initially kept speeds down but as the trip progressed we picked up the pace. We didn't really feel comfortable or relaxed until we crossed the border into Alberta. We eventually made it home, hitting Calgary at the tail end of a rain storm which gave us a treat as we made our way through the city. A double rainbow to welcome back to Calgary! Sunday morning found me in the garage removing Alex's hub and getting packaged up to be mailed back to him the following morning. I also rebuilt both front hubs just to be sure that all my bases were covered. Alex got his hub back in plenty of time to make the trip from Montana to North Carolina for Festiva Madness X. Things could have been a lot worse when the rear bearing initially failed... the wheel didn't come off the car as it could have! Roger at The Parts Store in Great Falls was of great help by having the parts on hand and loaning us the tools. Alex's job at the time called him away from home quite often and he was available when we needed his help. Shiloh Automotive was very helpful in getting us back on the road as best they could. They even arranged a partial refund of our repair costs! Jerett Miller at Rocky Mountain Tire in Red Lodge was very helpful in diagnosing the problem and getting us back to Billings. We got to meet Jeremy Funke and ride in his tow truck, the Hulk. He made the trip back to Billings as pleasant as it could be. We broke down before reaching Red Lodge. Had it been after we probably would have been out of cell phone service. We now know how to get around Billings on its public transportation system. Ironically, it was the rear bearing making the noise all along. The front hub rebuilds were unnecessary and it's unfortunate that it was one of those that failed. The Beartooth Highway is still on our bucket list... maybe next year!